This is my third and probably last attempt at writing SF. I may be improving a little but it’s all very time consuming. Again, I’ve tried, very briefly, to summarise the story leading up to this episode but reading the other episodes first should make things clearer. For the most part, the historical events concerning my home town of Malvern are accurate. Malvern (Worcestershire, UK) was indeed a well-known spa frequented by rich and famous Victorians though the success of the Water Cure probably owes more to fresh air, exercise and an improved diet than the miraculous properties of Malvern water! Maybe it was the beer but Jim was quite relaxed given the alarming circumstances. Here he was in an Edinburgh pub, dreaming or not, trapped a hundred years in the past with crazy Sue from something called the Experimental Philosophical Unit (EPU) who at this very moment was kissing his grandfather-to-be. The global predicament was crazy too. World War 1 had not started on cue and if that was not enough, Christine, his grandmother-to-be, was heading right now for his grandfather-to-be, with a broken bottle in her hand and murder in her eye. A short balding man in a doctor’s white coat and a stethoscope hanging ostentatiously from his neck had entered the pub by a side entrance. Shoving his way through a crowd of drinkers to Jim’s table, he managed to arrive just before the irate Christine angrily brandishing her broken bottle. “Very well done Tam!”, exclaimed the doctor loudly, shaking Tam vigorously by the shoulder. Tam, taken by surprise, promptly released Sue while the doctor turned to Christine, now stopped in her tracks. Here he poked a startled Tam. “Aye!”, spluttered Tam, eager for any way out. Christine’s jaw dropped as did the broken bottle and she ran over to embrace Tam. Colliding heavily with Tam she grabbed him so tightly that he lost his balance and they both fell on the floor. Jim, Sue and the doctor took the opportunity to beat a hasty exit through the side door. The doctor, who said his name was Simon, led them through a network of dark alleyways climbing upwards towards the castle until they reached a doorway marked, ‘Camera Obscura’. Simon entered, quickly paid the doorman and ushered them all up a dark spiral staircase. He pushed open the door at the very top and they entered a small darkened room. Simon managed to jam the door closed behind them. Jim thought this a little ungracious considering her escape from Christine’s vengeance but Simon had already launched into a lecture on the Camera Obscura. Someone was trying the door from the outside. The knocking at the door became louder but Simon continued. Jim could hardly believe his luck as Simon closed his eyes and raised both arms dramatically. Gradually the panoramic image before them became lost in a thickening, spherically-shaped cloud of pink smoke. A series of rods and dials of various sizes and colours began to protrude from it at odd angles. “This is ludicrous. He’s just showing off!”, said Sue none too quietly. She backed away from the smoke coughing loudly. Now the knocking at the door was incessant. Simon dropped his arms in exasperation and went off to remonstrate with those outside the door. “Let’s open a window” said Sue. She pulled up a blind covering a small window and pushed it wide open. “That’s better!”, she cried as a wisp of pink smoke lazily turned towards the window and darted outside.The wisp was followed more rapidly by another and yet another until the entire cloud, replete with levers and dials had moved towards the window. It hovered uncertainly by the window for a second and then suddenly made a dash for freedom like bath water down a plug hole. Sue tried to arrest it by grabbing a large red lever marked ‘ON‘ ……. Jim came to lying on the floor. He was conscious of more banging at the door, only this time it was accompanied by a querulous, aristocratic voice. Sue helped Jim to his feet. Jim looked round. The room was different with no windows and the panoramic view was of a small town. She furrowed her brow, stared into space and quoted. Meanwhile, Simon was angrily tugging at the door. Before Jim could ask what Simon’s mission was, a portly old man staggered through the now open door holding a hip flask. He hastily pushed the hip flask into Sue’s pocket. Simon, assuming an authoritative air twirled his stethoscope nonchalantly. But Simon interrupted him with further questions. “He’s trying to find out whether the man’s a philosophical zombie.”, she muttered. Pushing Simon aside she trod heavily on the man’s foot. He let out an ear-splitting yell and attracted the attention of two muscular attendants in white coats. “There he is!” said one grabbing the man’s arms. “Why did you do that Sue?”, raged Simon, ‘I was sounding him out so subtly and now you’ve ruined it! “Oh no I’ve not!” countered Sue triumphantly. Jim pushed the door wide open and was surprised to find it led directly to the outside and onto a path descending a steep hillside dotted with bushes and small trees. They all made their way slowly downhill passing several groups of patients wielding long walking sticks. Simon insisted on engaging many patients in conversation and at last they reached St Ann’s Well. The area outside the well house was populated by visitors, several on the donkeys used to convey the less mobile up the slope from the town below. Simon confronted a pale but severe-looking lady resting on a bench with an anxious footman in attendance. The footman stood up and moved menacingly between her and Simon. Simon bowed. Surprisingly, the lady obeyed. Simon examined her tongue gravely, slowly gyrating his stethoscope in front of her face. “He’s showing off again!” said Sue to Jim. Sue, anxious to improve her knowledge of the water cure, took the footman aside and told him that she and her brother had just arrived and what could he tell her about things here? He was happy to oblige. But Sue urged him on. Sue asked him how his lady could possibly withstand such treatment. He glanced at the lady sorrowfully. “Don’t you worry!”, said Sue quickly, who was moved by the footman’s story. When Sue returned with the flask Simon had taken leave of the lady and was now talking to an attendant. Sue gave the flask to the footman. Astonished, Sue bowed politely to the famous nurse. As they moved away she told Jim not to tell Simon who the lady was so Jim stayed silent while Simon, having dismissed the attendant, informed them that the lady was definitely not a p-zombie. “In fact, she has brucellosis and is terminally ill.” he announced pompously. “I give her 2 weeks at the most. 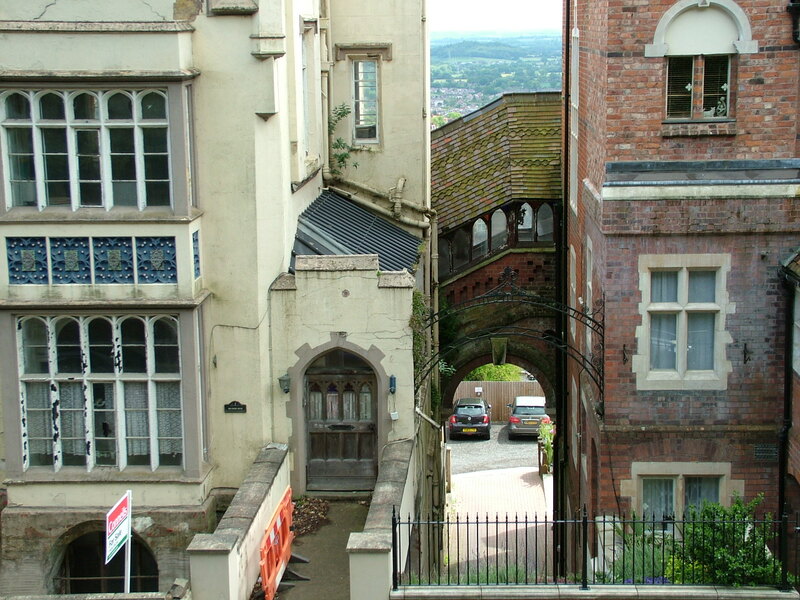 But more importantly, she says there’s some very strange goings-on in Tudor House – something about a ‘Bridge of Sighs’. Sounds like p-zombie activity to me so I’ve made arrangements to get us in there. Follow me!” He strode on purposefully towards the town followed by Jim and Sue who lingered some distance behind. Now Jim happened to know that Florence Nightingale lived to be 90 and put this to Sue. She was smiling. “Simon thinks we’re on a timeline where Florence dies prematurely and the nursing profession is set back by decades – but little does he know.”, she chuckled. This was all beyond Jim but by now they had entered the town and reached the imposing new building that was Tudor House. It started to rain heavily and Simon beckoned them to hurry. He knocked loudly on the door and it was opened by the same attendant he had talked with on the hillside. He pointed to the heavy door at the Holyrood end of the corridor. Jim and Sue exchanged puzzled glances. He carefully spread out Simon’s damp coat on a chair and left. Simon explained that he’d registered Jim and Sue for a week’s water cure at Tudor House, this being an excellent opportunity to investigate the strange goings-on. This was not well received and Sue protested loudly. Just then, the same two muscular attendants, who earlier had dealt with the old man, entered the corridor. Having been instructed to humour lunatics before attempting restraint, the duo paused deferentially, straitjackets at the ready. “We’ll take over now, Dr Fitzroy-Davidson” said one to Jim after a few moments. “Of course you are Sir and a good doctor too, with a real stethoscope but it’s time for a nice glass of water. Come along now Sir!” and the attendant grabbed Simon’s arm. While Sue and Simon had been arguing, Jim, not short of initiative when under pressure, had sidled over to the chair where Simon’s damp white coat had been left and had put it on. Now he approached the astonished Simon and snatched the stethoscope from his neck. “You can’t do this to me!”, Simon spluttered. Sue was not slow to put him right. “Bah! – its a better timeline anyway!”, retorted Sue. The two attendants, amused at first by these apparently insane ramblings, finally ran out of patience. Deftly securing Simon in one of the straitjackets they marched him away protesting loudly. The attendants waved in acquiescence and whisked Simon off to enjoy a week’s water cure. When Simon’s shouts were barely audible, Jim and Sue strode down the corridor passing the guard who waved them on after a nominal glance at Jim’s white coat. They proceeded down the Tudor House stairs at a brisk pace. “How’s Miss Nightingale?”, asked Sue politely. “Don’t look so stunned!” laughed the footman. Sue stared at him in amazement. “You’re the p-zombie they’re all looking for”, she squealed. Jim thought this was pretty noble for an unconscious zombie but was anxious to get out of Tudor House. They wished the p-zombie the best of luck and quickly escaped. As they headed for the Obscura room Sue stopped several times to refresh herself from the flask the old man had given her and she was in high spirits as they made their way up the hillside. “Sorry, but you know how I am with numbers!”, said Sue with sincerity and then remarked on the high quality of Malvern water. She offered Jim a swig from the hip flask, now nearly empty. Taking a hearty swig he nearly choked. Fortunately no one was in the Obscura room when they arrived as Sue could not wait to demonstrate her expertise. “Yeah!, 2014, 2014, 2014, ….” repeated Jim hopefully. Jim was not amused and wished she would get on with whatever she did but Sue continued to explain. “You’ll lose all memory of being here and simply think you’ve been asleep for about 20 minutes. I’m setting the projector for your timeline at 2104 – I mean 2014. All systems green and go!”, she shouted excitedly and closed her eyes. Jim held his breath. Jim woke with a start. Glancing at his watch, he’d been asleep on the bench for about 20 minutes. There was a man sitting beside him, apparently just waking up. The man stood up, stretched for a moment and went on his way. So did Jim – the man turned round and Jim confronted his identical twin…. Jim woke with a start. Glancing at his watch, he’d been asleep on the bench for about 20 minutes. Sue was sitting beside him. “Excuse me, have you the time?”, she said politely. “What’s going on Sue?”, asked Jim. Sue frowned. Jim did not see and began to look around as the courtyard darkened. Sue frowned. Jim cast his eyes heavenwards as a gigantic flying saucer hovered above them. Jim woke with a start. Glancing at his watch, he’d been asleep on the bench for about 20 minutes but now he was wearing a damp white coat and a stethoscope hung round his neck. A young lady in fancy dress was watching him intently from the other side of the courtyard. “Effing medical student stunt!”, he muttered to himself remembering it was rag week. He took off the coat wondering how they’d put it on him, stuffed the stethoscope into the pocket and left everything on the bench. He stood up, stretched for a moment and went on his way…. Jim woke with a start. Glancing at his watch, he’d been asleep on the bench for about 20 minutes. He stood up, stretched for a moment and went on his way…. Jim woke with a start…..